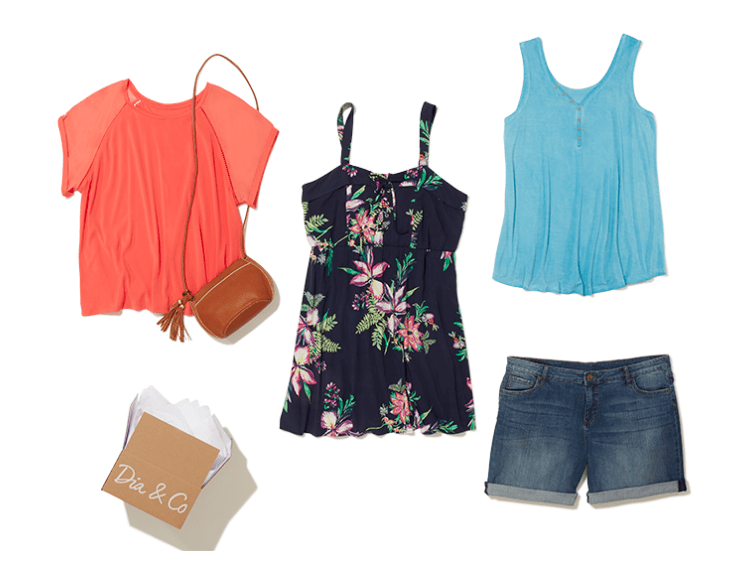 We have shared frequently about Stitch Fix, an online personal stylist service for men & women and we wanted to share about another personal stylist website we have learned about specifically for plus size women. Dia & Co is an online personal stylist service for women, sizes 14 & up. Dia & Co is a service in which you will fill out a Style Quiz with information about your size, style, and more. Then your personal stylist will send you 5 curated items, which are personalized to your style & size, directly to your home. You can then try on the items in the comfort of your home & decide whether or not you want to keep them. Shipping is free with all boxes & you will get free returns and exchanges for a different size with a postage-paid envelope to drop your items in if you choose to return them. So, it’s an easy & seamless process to try on clothes and accessories, without having to head to a number of stores and having the expertise of a personal stylist to put together outfits for you. And you can return anything you don’t want at no cost to you. Whether you are looking for a new wardrobe due to job changes & needing more professional clothes or just want to add some updates to your wardrobe, they have a wide variety of clothes, shoes & accessories to choose from. And these stylists are trained to know which brands may run small or big & how to find the right sizes for you based on that knowledge. Review the items in your box & try them on, deciding what you will keep or if you will send any back. You have 5 days to do this. You can keep one, two or three, etc & then send any items back that you don’t want. You will have a postage paid Priority Mail envelope to use & all you have to do is drop your bag at the Post Office mailbox within that 5 day timeframe. If you keep even one item, your $20 styling fee will be applied to your purchase of that item(s). Provide feedback to Dia & Co about your box – regardless of whether you keep all the items or return all the items or some of the items, make sure to fill out the Feedback form & checkout before you send back any items from your box. This is where you can have your $20 Styling fee applied to your order (if you keep any items). This is really important to provide the feedback for each item about what you liked & didn’t like to provide that information for your style profile for future Dia & Co boxes. Let us know if you have used Dia & Co before & what you think!